Announcing the Inaugural Eye of Winter Classic! I hope everyone is having a merry winter season! I’m sure many of you are kept warm in this cold season by the competitive fire burning within you. Well, get ready to stoke that fire, because RNG Eternal is announcing the first ever Eye of Winter Classic! The EoW Classic is an open entry double elimination single-day tournament, which has prizing support generously provided by Jellomoose of eternaldecks.cards and will be cast from start to finish by our in-house RNG Eternal casting team. While the season may be cold and this is a fun tournament, rest assured that players will packing plenty of hot decks! The Eye of Winter Classic will take place on December 28th, 2016, beginning at 12pm EST (5pm UTC). Free to Enter. No entry restrictions. Any player possessing an Eternal account may register for the Eye of Winter Classic! Double Elimination. Players will face off against each other in best of three matches. Once players lose their first match, they will drop to the losers bracket. A second match loss will eliminate them from the tournament. Independent Event. This tournament has no correlation with the Eternal Tournament Series. It does not award points, nor use them for seeding. Randomized Seeds. Registered players will be assigned their first pairing randomly. The Eye of Winter Classic uses a two stage registration system. First, create a Challonge account. When you register for the tournament, you are allowed to choose a custom name. Please make sure that your registered name is your Eternal Username, including the plus sign and your four digit friend code. Players who do not register with their proper Eternal account name will be unable to register their decklist for the tournament. Once you have the correct Challonge name, register for the tournament bracket here. Once you’ve registered for the tournament itself, register your tournament decklist via the following form. Players will only be able to register a single decklist, but will be able to go back and make edits if they need to. Decklist submissions will close at 7:01 pm EST on December 27th (12:01 am UTC on December 28th). You do not need to register your decklist at the same time you register for the tournament, but must do so before the decklist registration closes or you will be disqualified from the tournament. Check in occurs via the Challonge bracket an hour before the tournament begins. If you are not checked in before the tournament starts, you will be disqualified. 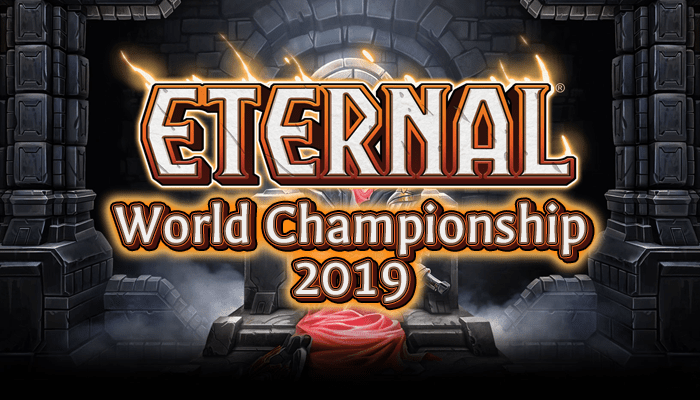 The tournament will be streamed Live starting at 11am EST on the official RNG Eternal Twitch channel. The in-house casting team will return to cover the matches and provide in depth coverage of the tournament’s progression. I hope you’re all as excited as I am for this tournament, whether you’re a tournament veteran, a first time player, or an enthusiastic spectator. I look forward to seeing who can weather the storm and reign victorious in the Eye of Winter Classic! No more than four copies of a single card may be included between main deck and sideboard. You must own every card you register. You deck must meet Eternal power restrictions (minimum 1/3rd power, maximum 2/3rds power). Decklists are public information and will be made publicly available on the day of the tournament. Individual matches are played in challenge games between the two players. In order to facilitate this, add your paired opponent as a friend on Eternal, then challenge them. Matches are best two out of three for the majority of the Tournament Bracket. You must play your main deck as registered for the first game of every match. After the first game, both players may take time to swap cards between their main deck and sideboard. Your deck must adhere to all previously mentioned deck construction rules after sideboarding. The Loser’s Finals, Winner’s Finals, and Grand Finals will all be played in Best of Five Matches. The winner of the Winner’s Finals has Winner’s Bracket advantage and will need to be defeated twice. There are no draws allowed, intentional or otherwise. In the event of a round finishing before a match, the current game will be suspended. The player with more game wins in the match will be awarded the match win. If the players are tied, a screenshot of the current gamestate will determine the winner, in the same manner as the game itself: The player with the highest life total will win, then the player with more cards left in their deck, then the player who went second in the game. Disconnects: Unfortunately disconnects do happen, and it is good sportsmanship to wait as long as possible for the other player to return. If you lose a game due to a disconnect, it counts as a game loss, even if you were winning beforehand. You have ten minutes from the end of the game to return and complete your matches, or you will be assigned a match loss and dropped from the tournament. Players who violate one or more rules will receive a warning from the Tournament Organizer for the first offense, will be disqualified from the tournament for a second violation, and will be banned from the Eternal Tournament Series for frequent or flagrant offenses. We’re gonna be running the tournament predominantly through challonge. Because it’s a double elimination style rather than a swiss, players can start their matches whenever they are paired. Challonge will notify you directly, and you will report the scores directly to challonge. If you wish to dispute a reported score, PM me IMMEDIATELY. Normal timing rules apply – once you’ve been notified of your pairing, you will have ten minutes to contact your opponent. If your opponent does not contact you, PM me. Failing to show up in 10 minutes constitutes a game loss. You will have a further 5 minutes to appear and play your match down a game, starting in game two with both players playing their main deck. If a player does not appear within that 5 minute time frame, they will be dropped from the tournament. Once players have begun their matches, they will have 50 minutes to finish them, as normal. In this way, rounds will roll as players are available – the WB finalist will have a long long wait for grand finals. Please don’t go too far from your computer, as your next match could start in 10 minutes or less. While this may not be the most relaxed way to do a tournament, it is the most efficient way to quickly handle a tournament of this size. Please plan to be within ten minutes of your computer at all times throughout the day. The coverage team will do its best to stay on top of all the matches and will slow down its chosen feature match each round. In between matches, we’ll keep you appraised of the developments! Being disqualified from a tournament invalidates all the Invitational Points you would have gained from that tournament, but does not prevent you from playing in future tournaments. Tournament bans are permanent but may be repealed at a later date. Illegal Deck – If you play or reveal a card in your deck that is not in your registered decklist (main or sideboard), you will receive a game loss and be forced to switch to your unsideboarded main deck as registered. If you notice during the Mulligan phase and can provide a screenshot of the card in your opening hand before actions have been taken, a warning will be issued and the current game will be nullified and remade. Mis-Sideboard – If you play or reveal a card in your deck that is not in your registered main deck but IS in your sideboard during the first game of a match, you will receive a game loss. However, you will be allowed to sideboard with your proper registered deck before playing additional games. If you notice during the Mulligan phase and can provide a screenshot of the card in your opening hand before actions have been taken, a warning will be issued and the current game will be nullified and remade. Stream Sniping – Watching or otherwise receiving information from the streamed broadcast of a player you are currently playing is a violation of the rules. Watching streamers during tournament rounds you are not playing them is fine! However, once the round begins and you learn your opponent, you must immediately leave their stream until the match is over. Simply muting it is not good enough. While this is difficult to find and enforce, if a player provides plausible proof that you are Stream Sniping, you will receive a warning. This is considered a flagrant offence and you will be permanently banned for multiple offenses. Immediate Concession – Any match you play, you must actually play the match! You cannot snap concede a round without dropping from the tournament. If you do so, yo will be dropped from the tournament. Collusion/Prize Splitting/Bribery – If it is suspected that one player intentionally threw a match to allow another player to advance, or that a match result was altered by external motivation including bribery and threats, the matter will be investigated. Unsportsmanlike/Abuse – Sometimes you win and sometimes you lose. You are allowed (indeed encouraged) to congratulate your opponent on the win and maybe share some lighthearted salt about unlucky/lucky draws, but please do not harass your opponents or other players. If you have been asked to stop, you’ve crossed the line and need to stop complaining. Never call an opponent anything demeaning or inappropriate. They engaged you in a fair contest and you should respect that. If you feel that the contest was unfair (and I don’t mean unlucky) please consult the Tournament Organizer. This is considered a flagrant offense and you will be dropped and potentially banned after your first warning. BM – BM is not in and of itself a rules violation. In moderation, such as torching your own face before making a lethal attack, it is harmless. However, excessive BM is exceedingly disrespectful towards your opponent and will not be tolerated. If frequent complaints about BM are made, your play will be investigated. Slow Play – Yes, there are some difficult decisions to make, but you slow down the rest of the tournament. Complains of frequent slow play will result in an investigation. What exactly is a “Champion Badge”? On the Eternal Discord Channel (https://discord.gg/j9yFk7u) Players who have won major tournaments get Champion Badges to show off their success! What time does it start that day?